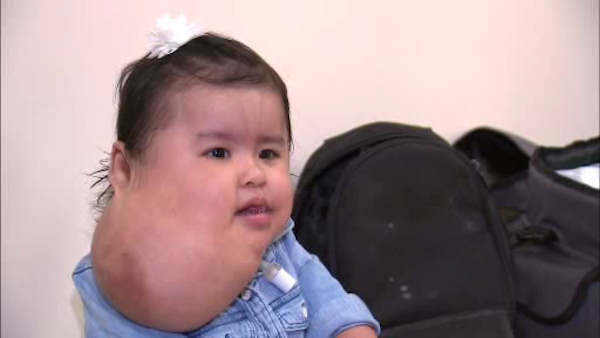 NEW YORK (WABC) -- A 1-year-old New York City girl with a large, rare growth on her neck is recovering after a successful surgery that her family hopes will change her future. Lenox Hill Hospital spokesperson Barbara Osborn said Sandy Diaz, of Corona, Queens, underwent an eight-hour procedure Wednesday that removed about 95 percent of the mass and preserved all of her facial nerves. She is currently in the post-operative recovery area with her parents and is doing very well. Osborn said Diaz looks dramatically different and, according to the surgical team, will function normally. Diaz was born in June 2015 with a softball-sized mass called a lymphatic malformation engulfing her neck. It is not malignant, but it has required her to use a breathing tube and could cause infections or other problems. Her mother, Maricela Benitez, said Sandy doesn't yet crawl or walk. "Right now, she can't go out," Maricela said. "It's not that she can't go anywhere, it's that I don't want to put her in danger. I have to take all these machines with me. I have to be very careful with her." Sandy's parents knew she had the growth even before she was born, but from the ultrasound, they had no idea it would end up being so large. The mass kept growing despite attempts to eliminate it, and Benitez and her husband, construction worker Herry Diaz, felt desperate. "You see, her life, it's not easy for her," Herry said. The surgeon, Dr. Milton Waner, said many children look normal and function likewise after the procedure. "It's going to be a very daunting and very difficult surgery," he said earlier this week. "Just about every major structure coming into the skull and base of the neck is surrounded by this lymphatic malformation." That includes arteries, vessels and nerves, which can be as wispy as spider webs and needed to be preserved while the mass is removed. Diaz will now have to learn how to eat and swallow, two things she hasn't been able to do.